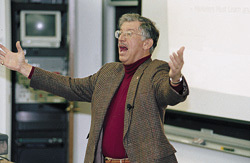 Prof. Lou Stern leads a dynamic MBA Update session. This spring, the Kellogg School of Management hosted four new MBA Updates, including one titled Marketing B2B and Channels. The day-long academic program provided a refresher course for Kellogg graduates who returned to Evanston to experience marketing insights shared by two of the schools distinguished senior faculty, Professors Louis Stern and James Anderson. The program was the latest in the series of popular academic initiatives offered by Kellogg. The morning session was devoted to Professor Andersons discussion about the importance of properly defining and measuring value in a companys products and services; the afternoon session featured Professor Sterns exploration of the ways the Internet has impacted marketing, and the challenges facing companies as they adjust their marketing strategies to meet the demands of the digital age. Really understanding value in business markets and how to assess it through building customer value models provide participants with a means for gaining an equitable return on the superior value that their offerings deliver to targeted segments and customers, explained Anderson, the William L. Ford Distinguished Professor of Marketing and Wholesale Distribution. MBA Update is one of the academic programs sponsored by the Kellogg School to deliver added value for its graduates. Additional spring MBA Updates included consideration of decision analysis and teams. The May 18 session will focus on entrepreneurship in family business. To learn how you can benefit from this strategic initiative, please visit the MBA Update page.